Lounging on the sofa gets even more relaxed with this couch drink holder. 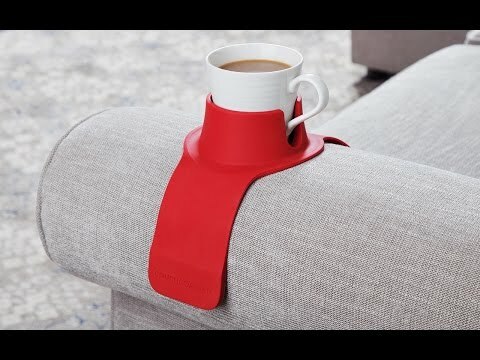 It’s a coaster-meets-cup-holder that safely contains drinks on the arm of couches and chairs. Flexible silicone sides drape over surfaces and are weighted for extra stability. And an adapter lets cans, glasses, bottles, or mugs of almost any size fit without spilling. Now your beverages stay upright and secure—and within reach. I am happy with this product overall. It would be nice if there were smaller sizes as my couch does not have wide hand rests. I love this drink holder. It keeps me from wiping up so many spilled beverages. I ended up buying 2. I use when laying in bed too. Never spills. Bought for friend that would sit and hold their drink on the arm of the chair. They absolutely loved it. Now chances of spills are obsolete. Cars have had cup holders for ages—but what about a couch drink holder? Chances are, you put more miles on your sofa than the road. CouchCoaster has your kicking-back-at-home beverage needs in mind. 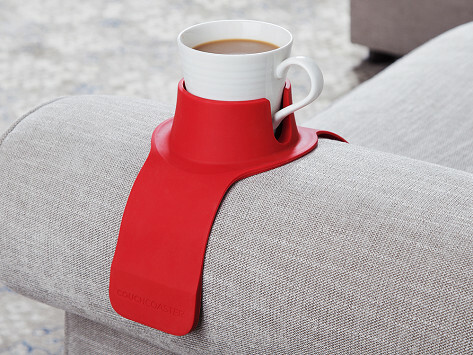 This adaptable drink holder drapes over the arm of your favorite place to sit. Its weighted sides keep your glass balanced and secure. Plus the design is flexible enough to fit over any width or shaped furniture arm—flat to curved, slim to wide. Brit Barry Freeder had had enough of spilled drinks in his living room. Balancing them on the armrest or the floor was asking for trouble. But the coffee table seemed just too far away. It’s a first world problem, for sure. But Barry’s first world solution is well made, well designed, and appropriately accessible without even sitting forward. Whatever you’re drinking, and whatever is on the telly, with CouchCoaster you can settle in and relax.